I'd like you to meet Apache. Apache enjoys spending time on the beach. This picture was taken while playing on Galveston beach in Galveston Texas. Apache is 21 months old and loves to go riding in the car and playing on the beach. Loves to play in the water. And toys, he's always playing with a toy we've bought him. Apache has so many toys he has his own toy box and when he's ready to play he will go to the toy box and bring a toy of his choice to play with. When we're outside Apache loves to play catch with his frisbee. 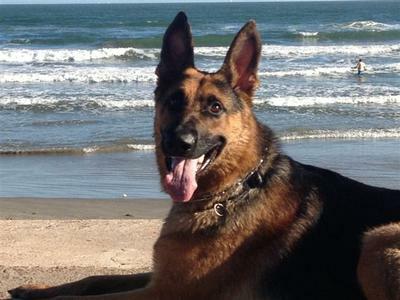 Thanks so very much for sending us in the story all about your incredible GSD Apache. He is absolutely gorgeous - what a great picture. I too have had several German Shepherds that absolutely thrived in the water - in fact, one of my German Shepherds from many years ago, Cera, was part fish - or at least I think she thought she was. It didn't matter if it was a puddle or a pond, if she had the opportunity, she was right in the middle of it. And it's a great form of exercise for them too so I'm really glad you've discovered how much he loves the water and allow him the opportunity to play in it as often as you do. Good for you! He sounds like quite the character. If you get the chance maybe sometime in the future you can send us a followup on how he is doing. I know I'm not the only one who would love to see some more pictures of him in action. Continued success with your German Shepherd Apache and I wish you two many more years of companionship. And thanks again for sharing him with us all here. Thanks for sharing. Your friend is beautiful. Our GSD is named Kanina Oya (warrior princess) She enjoys the water too. She, also, enjoys the snow and get a lot in Omaha. What a Handsome boy Apache is!!! Looks like his a good life with loving family. Great Picture and I love the beach scene with him! Take care of your boy and he will take care of you.